If you registered to go to the retreat, it is time to make a second payment or choose to pay your balance in full. Thanks to Stephanie, this can be done easily. The trick is to choose your button wisely! Please follow this link to the BMQG blog. Scroll down past the retreat info to the series of new payment buttons. The first two buttons are for those staying 2 nights. Pick either the single or double option depending on whether you have a roommate or not. If you are staying for 3 nights, the last two buttons are for you. Again, choose between a single or a double depending on which you signed up for. There is a pull down menu so that you can choose to pay in full or to just pay half of your remaining balance. All payments are due by Feb. 16th. At our February meeting (2/1/2014 from 10 am to 12 pm) at the Stratham Public Library in Stratham, NH we will be watching the Superior Threads DVD Thread Therapy with Dr. Bob. You can watch previews at the Superior Threads site. Superior Threads has generously offered our guild two $20 gift certificates to their store. We'll offer these certificates as door prizes. I know several of our members really like their thread for quilting, so I know I'm looking forward to maybe trying some new thread! Finally, if you're not cooking on your Riley Blake challenge yet, it's time to find those fabrics and make something quilted. We'll be voting on a guild winner at the February meeting, and the winner will receive a copy of Patchwork Please! by Ayumi Takahashi. Hope to see you all on February 1! Hello all! We're gearing up to make 2014 a great one for the guild. Our by-laws require that all are notified that an executive board meeting is taking place so..... there's one tomorrow at 10 am in West Newbury. Sorry for the late notice. All are welcome to attend, your input is encouraged. Email me if you'd like the address. Despite the foot or two of snow we all got at the end of last week, we held an informal sew-in for our first meeting of January 2014. We had a pretty good turnout given the snow! I counted eleven people at our meeting. The first item business is that we have rescheduled our photography workshop for the April 2014 meeting. So if you weren't able to back out of your driveway, no worries! Plan to bring your camera in April. The most important item of business is that all dues must be paid to the SMQG by Friday, January 10. If you have not yet paid your dues, you can mail a check to the PO box address (click the "Contact Us" link on this page). Please send an email to one of the officers (Peg, Judy, Laura, or Robin) to let us know your check is coming. Paying your individual dues on time is crucial as the amount of dues we pay to the National MQG scales to the number of people in our group. We want to have an accurate count! All Riley Blake Challenge projects are due at the February meeting. The deadline for posting photos to the MQG site is February 17. At the February meeting we will resume our block lottery! Samantha has chosen the Economy block. This block is a simple paper-pieced block. (Please do not make the traditionally-pieced block because of size discrepancies.) The paper-piecing template for the blocks is at Rita of Red Pepper Quilts' blog, here. You will have to download the template via Craftsy, but the template is free. For each entry, please make TWO blocks (they are small and simple) and bring $1 to contribute towards our guild's MQG dues. Color scheme is scrappy! I watched Mary whip up two or three of these blocks in a short time during our sew-in, so I think this is a fun block choice with a lot of potential to show off your treasured novelty fabrics. Karin showed off a tablet case she made--see her and Peg admiring it in the top photo. 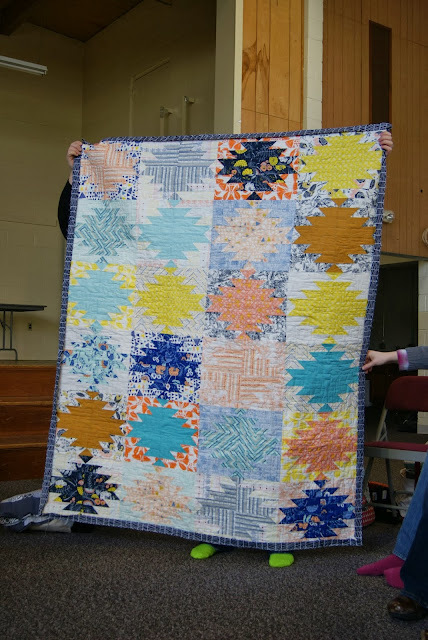 Instead of adding a separate, loose lining, she backed the pieces before quilting and assembling so the lining is quilted together with the front and isn't all loose. Smart. And here is a teal and orange baby quilt that Karin showed. I love this color scheme for winter--makes me think of places more tropical than Massachusetts! Mary is ahead of the game having already finished her Riley Blake Challenge top. 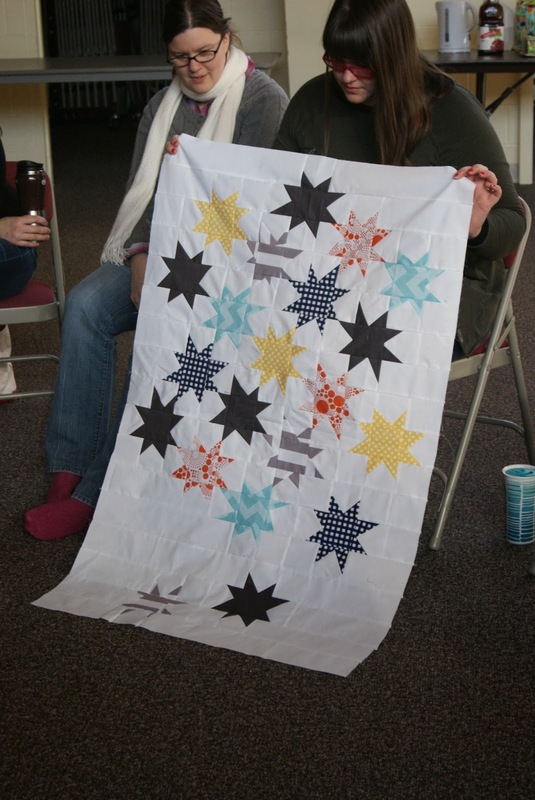 She even started quilting it at the meeting, so watch out. Amy recently had a project pattern published in the book Playful Little Paper-Pieced Projects. She made this sweet--but not-too-sweet, and not at all cheesy--Valentine's Day journal cover. She pointed out that she used a stamp to make the kiss detail! Amy also showed off her Squircle Quilt, which she designed to showcase Angela Walters' Legacy line for Art Gallery Fabrics. 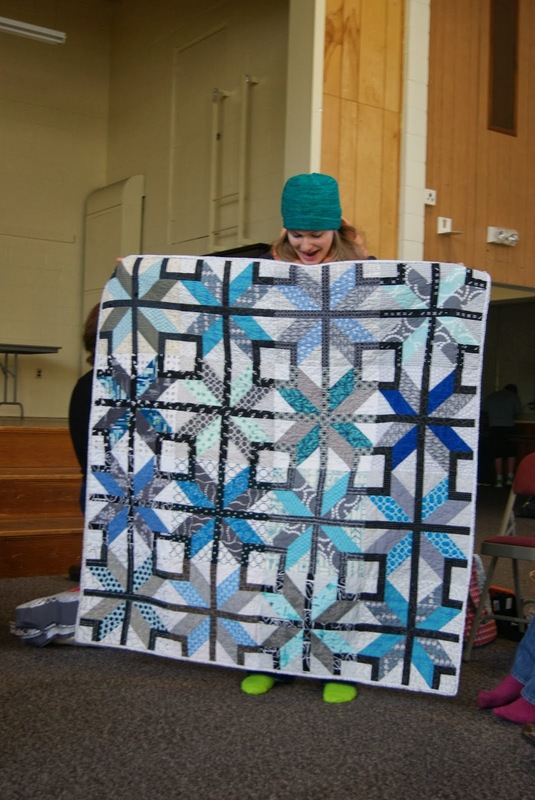 When I first saw photos of this quilt I thought it was a mini but it is quite big! The scale of the center squircle and the outside partial squircles make this a very interesting, modern twist on a classic square-in-a-square design. Paula has finished the pillow top she started at our guild's first sew-in in December 2012. She embroidered a sweet quote around the outside border while she sat in the evenings. Hooray for finishing things! Nancy and Debbie showed off a secret project--no photos allowed! Barbara showed off some knitting project bags she made to tote around her gift knitting. I think I need to make a few (dozen) of these for myself! 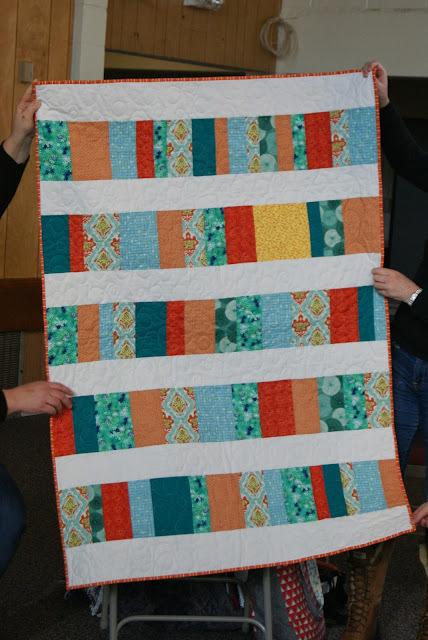 I finished my first quilt as a Do Good Stitches quilter. It is backed in gray minky dot and yes, it will be hard to send it away! And I showed an almost-finished quilt made out of Leah Duncan's line Tule (Peg is carrying some of these prints in her shop!). As usual, I was too busy chatting to take photos during our sew-in, but people were quite productive with their knitting, block-piecing, EPP, and hand sewing. Thanks to all who braved the snow and bitter cold to join us! Hope to see all of you at our February meeting in Stratham, NH at the Stratham Public Library. Due to the snow that WILL keep falling outside our windows (and in our driveways and on I-95 etc), we have rescheduled our Quilt Photography seminar for our April meeting. There is a high level of interest in this topic, and we wouldn't want anyone to miss it because the roads near them are impassable. HOWEVER, we still plan to meet on Saturday 1/4 from 10am-12pm at the West Newbury Town Hall Annex. Bring your sewing machines and any power strips/extension cords you have to spare, and we'll have a low-key SMQG sew-in! If the snow does not quit and the roads are dangerous, Peg/the officers will cancel the meeting by early Saturday morning. If you have not yet paid your 2014 dues ($50) please bring your payment to the January meeting. Of course, we will still have show and tell. Stay safe and warm, and I wish everyone more sewing time than shoveling time. Our January meeting will be held on January 4, 2014 from 10 am to 12 pm at the West Newbury Town Hall Annex. At this meeting we will be holding our long-anticipated photography workshop! Please bring your camera (DSLR or point & shoot) or the electronic device you use to take pictures. As always, please bring items for show and tell. If you haven't yet begun your Riley Blake Challenge item, it might be time to think of a plan! We'll be voting on our guild's winner at our February meeting. ETA a weather note: in case of snow/a storm, check your email and/or Facebook. If we cancel due to weather, we will send out a notice by 8 am the day of the meeting.